I've been mulling over the 'language justice' terminology used by a lot of my compas who organize to make our movements more multilingual. I don't really like it. My sense is that it makes it sound like making the space fully bilingual is about justice for limited English speakers - or at any rate it seems easy for fluent English speakers to interpret it that way - rather than understanding that it benefits, say, limited Spanish speakers as much or more to have a broader more inclusive smarter movement with access to more experiences and insights. 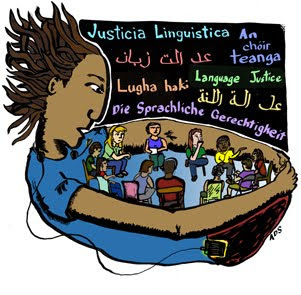 Rather than talk about 'language justice' I would prefer calling it the 'bilingual space committee' or what have you. Of course a bilingual space involves much more than interp and trans, but also bilingual facilitation and more (for how to see the great tips in the resource in this post). Now if it's a matter of getting proper language interpretation in court, there I'm all for using the term 'language justice'. "Wayside has made a commitment to build and amplify voices and languages not often heard in organizing and movement spaces. We are working in Virginia and DC with organizations that see the need, and the organizing power, of connecting people across race and language especially in immigrant communities. When we begin to see language as a tool of empowerment that gives value to people's culture and way of being, our organizations grow in heart, experience, and perspective. When we begin to see that interpreting is not just for mono-lingual non-English speakers but in fact for everyone who is unable to understand all languages present in a conversation, we can begin to see people working from abundance and not deficiency. When we interpret well, we open space for the jokes, the perspectives and the soul of everyone in the room to come through, building deeper solidarity, democracy, and a broader movement for change."